The garage door installation is incredibly important, as it can determine whether you'll have to deal with frequent issues, or just the occasional malfunction (that may be prevented with the right maintenance routine). If the system isn't installed correctly, you could be dealing with more hassles than you should. Replacing your garage door with a new and improved model can be an excellent way to turn over a new leaf, as it were, and upgrade the security and safety of your home in the process. The longevity of the whole mechanism and the door's ability to protect your home from outside weather conditions will depend on the material you choose. Wood, steel, and aluminum each has different advantages and downsides, and understanding what those are is important. There are many different brands we work with, like Clopay, Raynor, and Windsor, for example, and they all have special models with different levels of insulation and various types of designs. But before you get to that point, you need to first determine which type of material is going to be the best choice for you. Steel Can Be A "Steal"
First, we want to apologize for this awful pun. But the meaning behind it stands true. A steel garage door can be an excellent choice as it will bolster the security of your home thanks to its sturdiness and durability. With proper maintenance and an annual application of a rust-resistant coating, this material can really shine. However, it will be heavier than other options, and your opener will need to be able to handle that weight. This material is considered the one with the most curb appeal. It offers a warm inviting look and can be a great addition to really any house. Wood is also a natural insulator, which is an excellent advantage that can allow you to spend less money on energy. The main downside, because there's always something, of course, is that a wooden garage door requires more maintenance. Regular repainting and cleaning are important, as the material can rot or warp if neglected, which will compromise both the look and security of your home. The main benefits this material offers are its lightweight and low maintenance requirements. 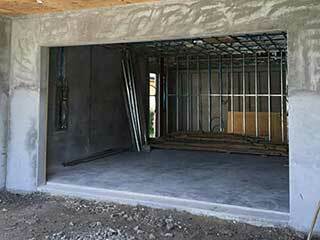 An aluminum garage door won't require a powerful opener, as this material is by far the lightest. It is also resistant to rust and therefore won't require as much maintenance as wood and steel doors. However, durability isn't one of its strong suits, and it can become easily dented. We have some good news for you. You don't have to memorize all of this information, nor do you have to start doing a lot of research by yourself. Our experts at Garage Door Repair Spring can consult you and answer any questions you may have. When it comes time to perform the new door installation, you'll be more than happy after our technicians get through with it. Contact us today.